How do I share my project with others? 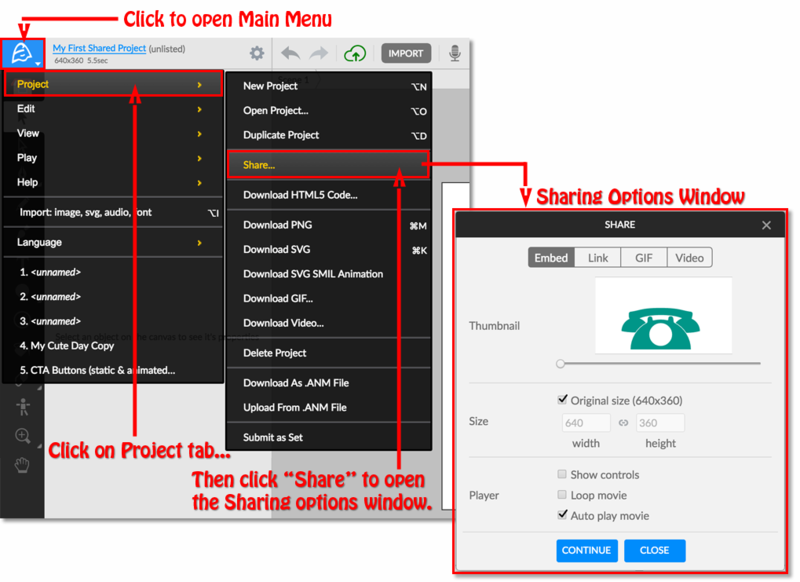 To invite others to view and/or edit your project, first check your project's Sharing and Privacy Settings and select the options best suited for your project. 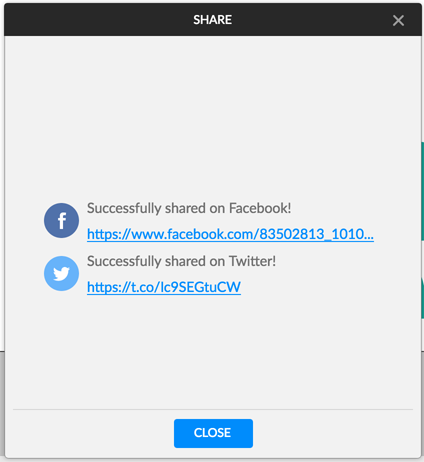 Then just copy the project's URL from your browser’s address bar and share the link! Note: the letter & number code after the animatron.com/#p= in your project’s URL, is unique to this exact project. As long as you are the Original Author, your project’s Privacy is set to Public or Unlisted, and Sharing settings are set to View and/or Copy, other people can access the project in the Editor from this URL. Check “Modifiable” ON in your Sharing Settings to allow others to directly edit this exact project. 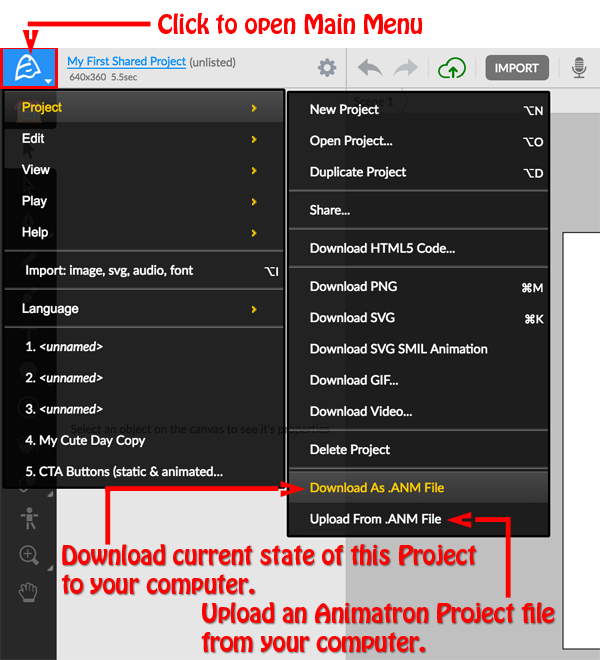 You can easily download the current state of your project as an .ANM file and share it with whomever you want to open the project, to review or continue working on in the Animatron Editor. Since this file is a saved state of your project, whomever Uploads this file in the Editor will be creating a duplicate of your project which does not directly affect the originally downloaded project. (ANM files can only be opened and edited in the Animatron Editor). From the Editor, click on the Main Menu and click on the Project tab. From here, you can click on “Download as .ANM File” to download the file directly to your computer’s default downloads folder. The receiving user can click on “Upload From .ANM File” in a fresh project to open and work on their own version of that project file. ...Or click on the Main Menu and hover over the Project tab. 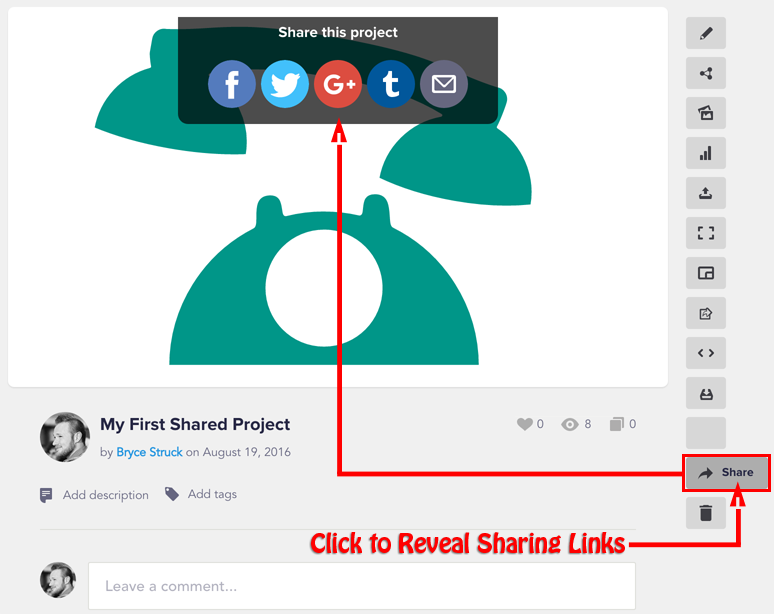 From here, you can click on “Share…” to see all of the various ways to share a movie of your project with another person. 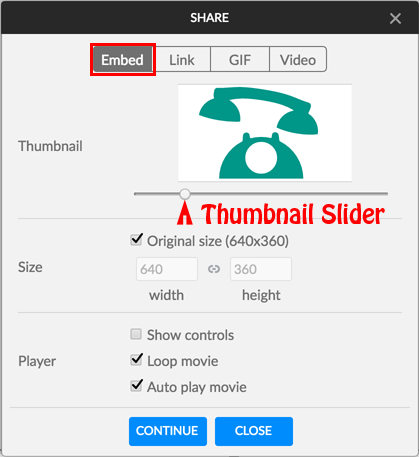 Using the Embed tab allows you to directly embed the published movie of this project into a webpage, blog article or online forum by providing you with a copyable HTML iFrame code that can be pasted directly into your website of choice. Before copying the code, you can set some essential options for how your iFrame is displayed and controlled. Clicking the posted link will send the viewer to your Project’s Preview Page on the Animatron website. From the Video tab: you can share your project’s movie to Facebook, Twitter and Youtube rendered in MP4 format. Add a description of your movie, add tags to your post and even choose to make your post private so only you can view it! 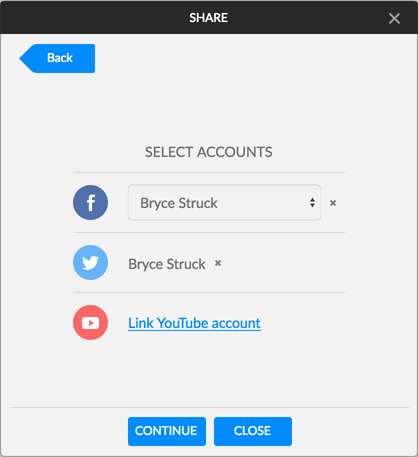 (Private checkbox only works on Facebook & Youtube). To share to a specific Facebook page you manage under your main account, just click on the dropdown list to select which page to share to. 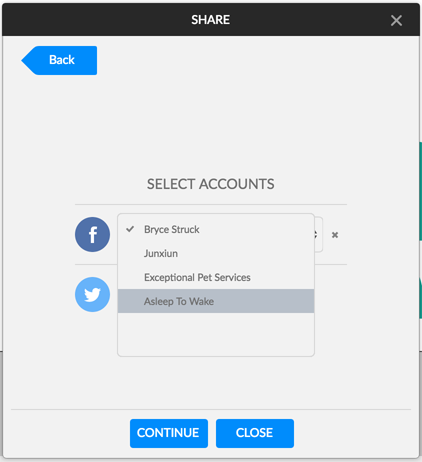 Press the ‘X’ next to your linked social media account to prevent sharing to that account. Finally, pressing the Continue button will post to all linked social media accounts and will provide URL links that will instantly show you the generated post(s). Your project’s Preview Page is a custom Animatron page that displays your movie according to your selected Project Settings and provides additional ways for invited and/or public viewers to comment and interact with your project outside of the Editor. To access your Preview Page from the Editor, you can click on your project name or click on “Go To Project Page” from your Account Tab. To share your Preview Page, simply copy the URL from your web browser’s address bar and paste the link wherever you want it to be accessed and seen by others. 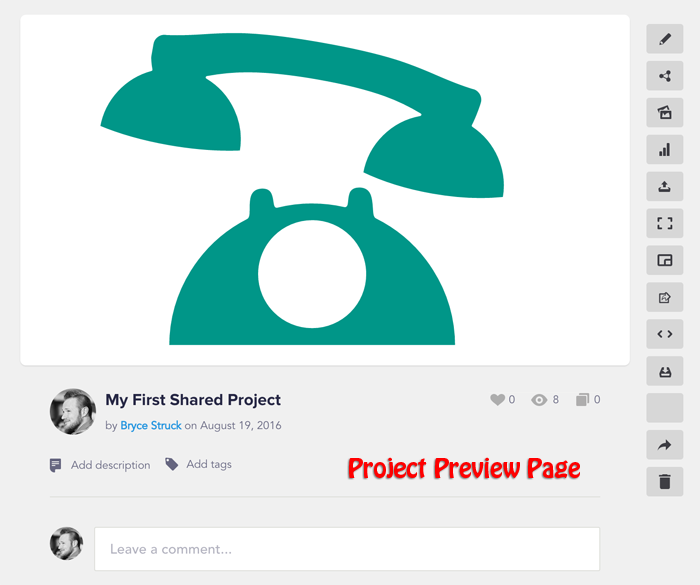 You can even share a Project Page directly to any linked social media and email accounts by clicking on the share button on the player’s sidebar. Learn about Downloading your project into various file formats, here!